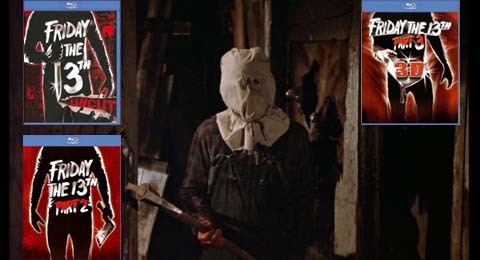 12.1.11 - Well, it looks as though fans will be busy in 2012 as there are a number of items being made available to buy from the Friday the 13th film franchise. We already know about the CD soundtrack box set being released in January and a combo Blu-Ray set featuring A Nightmare On Elm Street 2010, Friday the 13th 2009 and Freddy vs Jason. There has been mention of a full Blu-Ray box set for next year as well, but there could be even more. Nothing has been officially announced yet, but we hear that Paramount Pictures might be planning to release the first three films in the series in a miniature box set package, much like they did for all eight Paramount movies on DVD in 2011. This is sure to anger fans even more, who were not too thrilled that a DVD box set was released first before the high definition Blu-Rays were offered to the public. For right now, this 3 disc miniature box set of the first three films in the series is unconfirmed at this time, but very likely to be happening. Stay tuned for more updates on this three film set as well as even more news relating to Friday The 13th coming soon!